1½ lbs. ground meat (I used ½# hamburger, ½# pound turkey, ½# pork, which I had left from a previous recipe). In med skillet over med heat, add 1 TBSP olive oil. Add chopped onions and cook until just tender. Add in garlic. Remove from heat. Place ground meat in large mixing bowl. Add egg, coconut flour, salt, pepper, red pepper flakes, & parsley. With spoon or using clean hands, gently mix together. Using your hands, shape into small balls (approx 1½" in size). In a large skillet over med/high heat, add 2 TBSP olive oil. 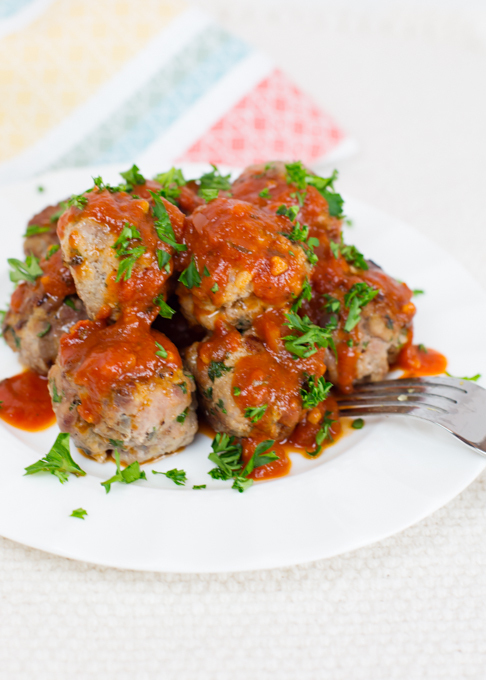 Cook meatballs in batches until browned on all sides, remove from pan and place on paper towel to drain off excess fat. Once all meatballs have been browned, place onto baking sheet and place in preheated 350* oven for about 5-8 minutes to finish cooking.